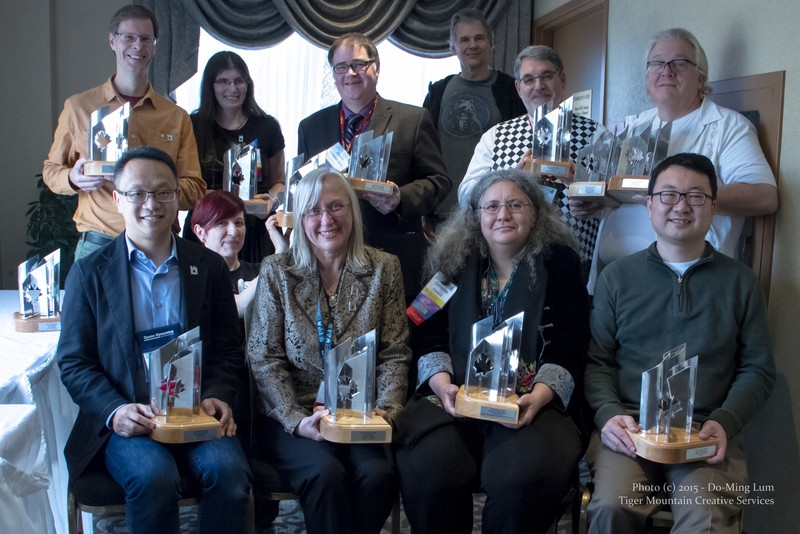 Here are the winners and accepters of the 2015 Prix Aurora Awards given November 22 at Canvention 35/SFContario 6 in Toronto. In the back row: Karl Schroeder, Kari Maaren, Derek Newman-Stille, Peter Watts (Awards MC), Clifford Samuels accepting for Copper Pig Writers’ Society, Hayden Trenholm accepting for Charles de Lint and Dan O’Driscoll. Front row of seated/crouching people: Eric Choi, Caitlin Sweet holding for Derek Newman-Stille, Julie Czerneda, Catherine Crockett accepting for Sandra Kasturi, Tony Pi. Photo credit: Do-Ming Lum, Tiger Mountain Creative Services. This entry was posted in Awards and tagged Aurora Awards, Prix Aurora by Mike Glyer. Bookmark the permalink. Congrats to all the winners. Classy looking trophy, too. Peter Watts appears to be somewhat tall.